In this article, you create a Java console application by using the Speech SDK. You transcribe speech to text in real time from your PC's microphone. The application is built with the Speech SDK Maven package, and the Eclipse Java IDE (v4.8) on 64-bit Windows, 64-bit Ubuntu Linux 16.04 / 18.04 or on macOS 10.13 or later. It runs on a 64-bit Java 8 runtime environment (JRE). If you're running Ubuntu 16.04/18.04, make sure these dependencies are installed before starting Eclipse. If you're running Windows (64-bit) ensure you have installed Microsoft Visual C++ Redistributable for your platform. In the Eclipse Launcher, in the Workspace field, enter the name of a new workspace directory. Then select Launch. In a moment, the main window of the Eclipse IDE appears. Close the Welcome screen if one is present. From the Eclipse menu bar, create a new project by choosing File > New > Project. The New Project dialog box appears. Select Java Project, and select Next. 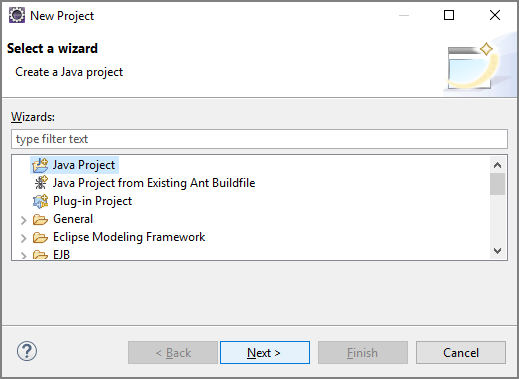 The New Java Project wizard starts. 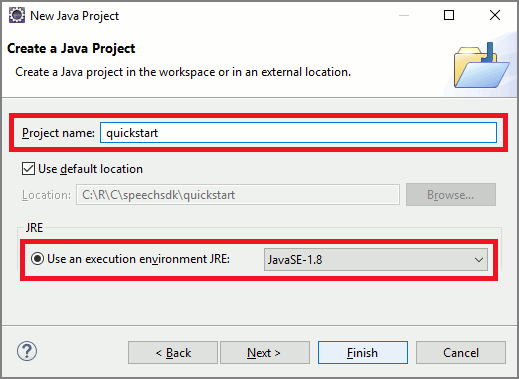 In the Project name field, enter quickstart, and choose JavaSE-1.8 as the execution environment. Select Finish. If the Open Associated Perspective? window appears, select Open Perspective. In the Package explorer, right-click the quickstart project. Choose Configure > Convert to Maven Project from the context menu. The Create new POM window appears. In the Group Id field, enter com.microsoft.cognitiveservices.speech.samples, and in the Artifact Id field, enter quickstart. Then select Finish. Open the pom.xml file and edit it. To add a new empty class to your Java project, select File > New > Class. In the New Java Class window, enter speechsdk.quickstart into the Package field, and Main into the Name field. 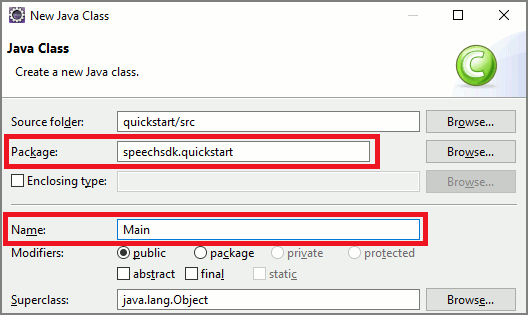 * Quickstart: recognize speech using the Speech SDK for Java. * @param args Arguments are ignored in this sample. Replace the string YourSubscriptionKey with your subscription key. Press F11, or select Run > Debug. The next 15 seconds of speech input from your microphone will be recognized and logged in the console window.